The last of the third round FA Cup ties saw defending champions Arsenal take on Championship side Nottingham Forest FC. The team fielded by Arsene Wenger was a fairly young team without the likes of Mesut Ozil and Alexis Sanchez, but much to the surprise of everyone, Arsenal ended up losing the game 4-2. The game was an action-packed one, with the Gunners conceding two penalties in the second half. 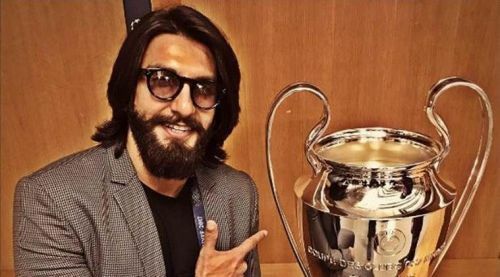 Bollywood star Ranveer Singh is a well known Arsenal fan and the ambassador for Premier League in India. However, he wasn't very happy with one of the penalties given against Arsenal and took to Twitter to express his displeasure. Football fans on Twitter were quick to point out that the game between Arsenal and Nottingham was an FA Cup game and not a Premier League one, giving the actor a fair bit of stick. Its not a @premierleague match!!! This is no Premier League game mate...???? Typical Arsenal fan, proved it by mentioning premier league for a FA Cup match. Well... That's actually the FA cup dude. Dude, it's an FA Cup tie, why are you tagging Premier League??? A majority of football fans bombarded Ranveer with tweets, telling him that this wasn't a Premier League game but an FA Cup game. Ranveer was made fun of because he claims to be a die-hard fan of Arsenal and yet was unaware of the competition that they are playing in. However, some fans also justified Ranveer Singh tagging Premier League and not the FA Cup. Fans speculated that he tagged the Premier League account because he is the official brand ambassador for the competition. Another reason why people thought that it was okay for him to mention the Premier League was the fact that one of the teams playing in the game was a PL side. But there’s a premier league club involved. So what’s the issue in mentioning them? Agreed. As ambassador of the @premierleague he would be interested in how the top teams in the league are doing in the domestic cup. Yes but premier league clubs are involved ,hence why! After losing out on the FA Cup this season, the only major trophies that Arsenal can realistically aim to win are the Europa League and the Carabao Cup. Also, the actor will be hoping to avoid such controversy the next time the Gunners play. Arsenal's 2014 FA Cup winners: Where are they now?